"The King of Broadway" "We Can Do It" "I Wanna Be a Producer" "Keep it Gay" "When You Got It, Flaunt It" "That Face" "Springtime for Hitler"
Starring two of Broadway’s best musical comedians, Nathan Lane and Matthew Broderick, the show rocketed its way to Broadway (after a sell-out engagement in Chicago) with $17 million in advance sales — less than half of “Miss Saigon”‘s advance, but huge for a musical originating in America. Audiences were devastated with laughter and the critics were — to a man — rapturous. After its April 19, 2001 opening, the show quickly became not only the hottest ticket in town but also the hottest ticket in almost a decade. 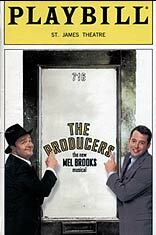 It won a record 12 Tony Awards, and when Lane and Broderick briefly returned to their roles in early 2004, they were the highest-paid performers in Broadway history. History repeats itself: the duo will also be starring in a film version of the musical.